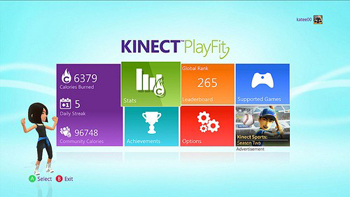 Microsoft has launched a new feature for the Xbox console today called Kinect PlayFit, which collects data about your activity and the calories you’ve burned playing a whole host of popular titles, such as Dance Central 2, Your Shape Fitness Evolved 2012 and even Kinect Star Wars (yeah, really), as well as a number of other games. Those interested in tracking their fitness will be able to earn different kinds of medals and achievements too, work their way up leaderboards so they can compete with other Xbox Live members and share their results among social networks, making them more inclined to really push themselves as they dance around, bend into yoga positions and fight off stormtroopers. The Kinect PlayFit is only available to Xbox Live members in the US at the moment and it’ll apparently be launching to those in other countries as soon as next week. Finger’s crossed the UK is next on the list.